Award-winning singer/songwriter Lilli Lewis grew up on a dirt road on the outskirts of Athens, GA. She is the daughter of a southern minister and a Chicago reared civil rights activist, and her bent towards social justice is reflected in her music and stage show. The prolific writer, composer, pianist, and producer has been composing music since she started playing piano at the age of three. Lewis is known for her powerful vocals and progressive message. The classically trained “folk-rock diva” is a sought after featured performer on main stages across the United States and abroad. In 2017, feminist folk trio The Malvinas recorded Lilli’s “O, Let Your Light Shine Bright” (Louisiana Red Hot, 2016) on God Bless the Grass (Soona Songs). 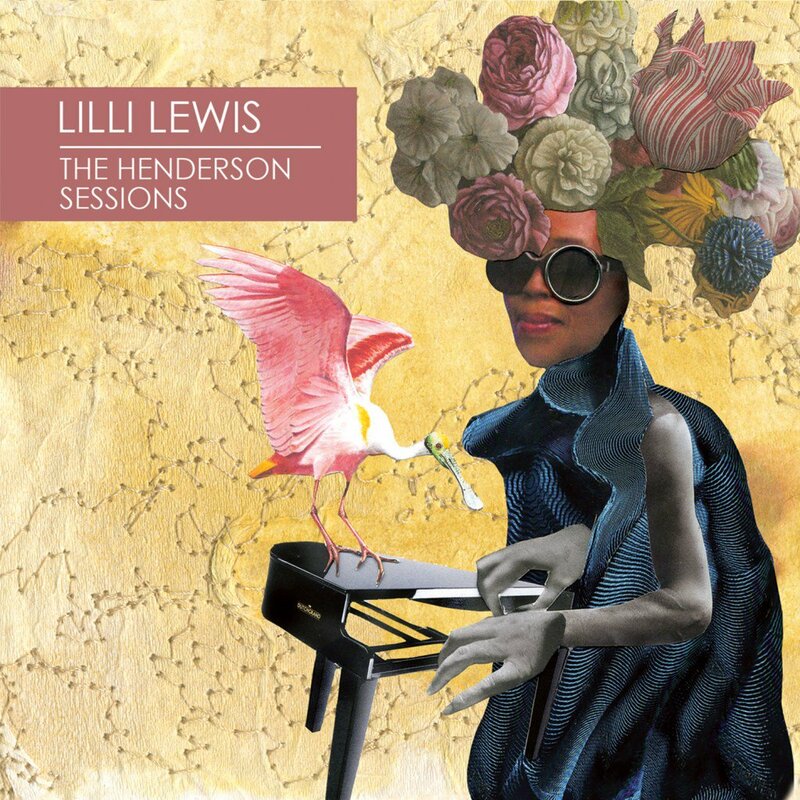 Lewis made New Orleans her home in 2013 where she performs regularly as a soloist and with her acoustic soul orchestra, The Lilli Lewis Project (LLP). Lewis is also a current member of sousaphone master Kirk Joseph’s Backyard Groove. 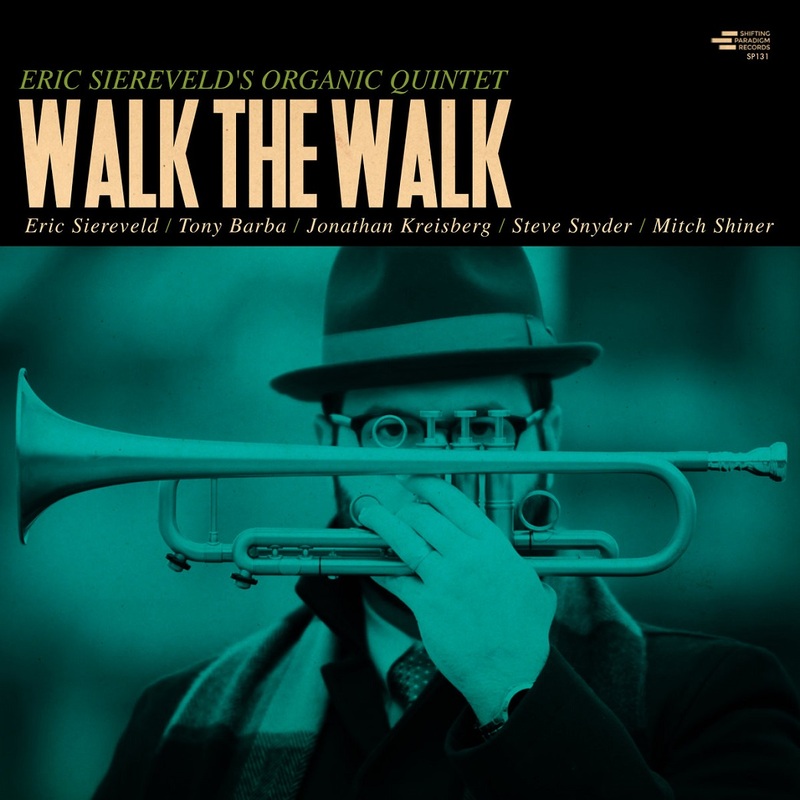 New York City based trumpeter Eric Siereveld has built a reputation as a multifaceted performer, composer and educator. Deeply influenced by the hard bop/post bop tradition, his compositions and improvisations are historically rooted yet forward thinking. 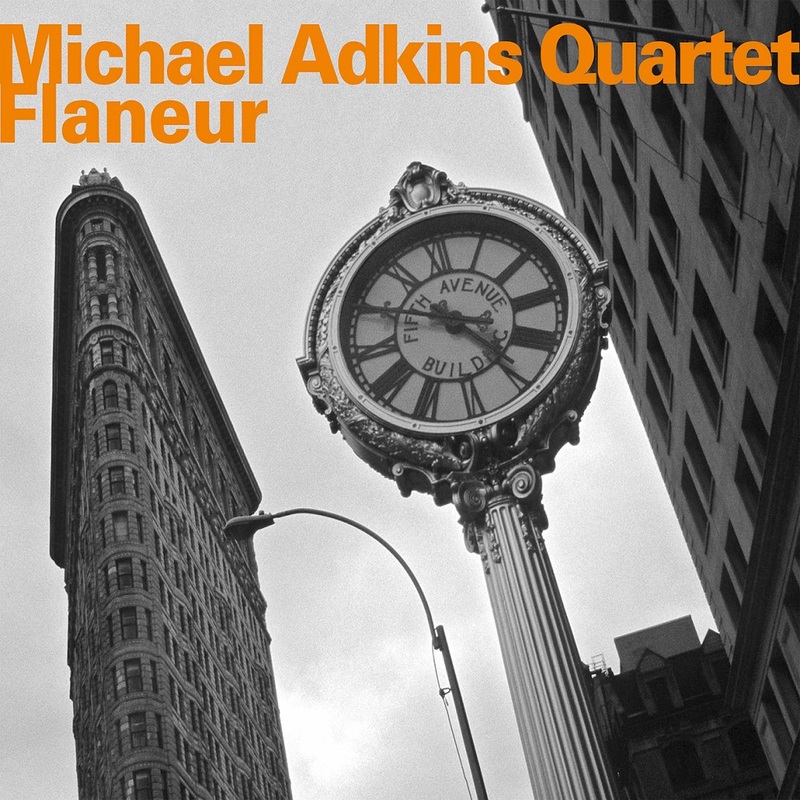 His current project, The Organic Quintet, is a fresh take on the classic organ jazz quintets of the 1960’s. 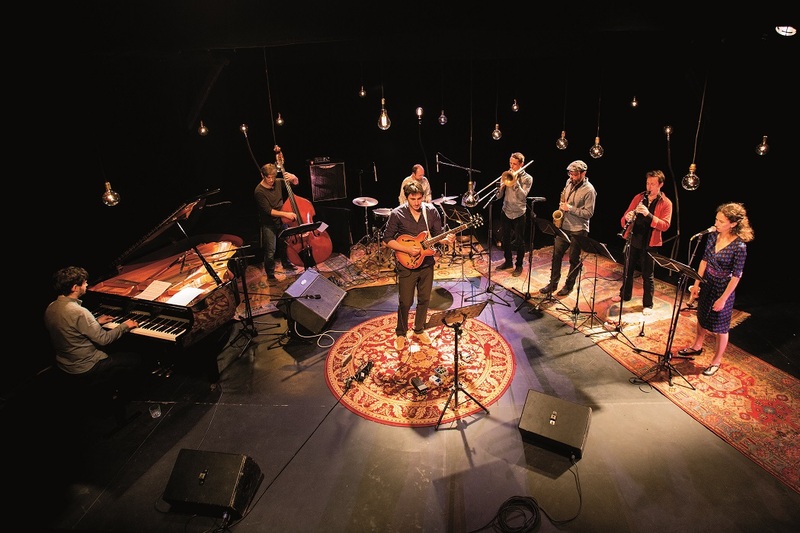 This group features internationally acclaimed guitarist Jonathan Kreisberg, Indianapolis organist Steve Snyder, Madison based tenor saxophonist Tony Barba and Milwaukee drummer Mitch Shiner. 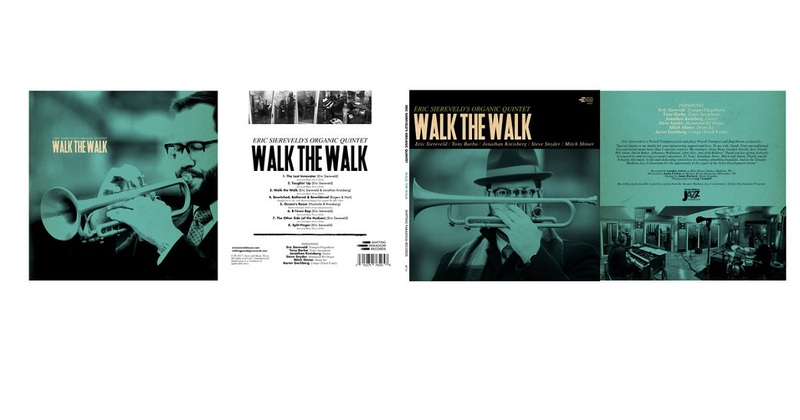 The group will release WALK THE WALK in February 2018. Preorders of the album will be available from Friday, December 1, 2017. 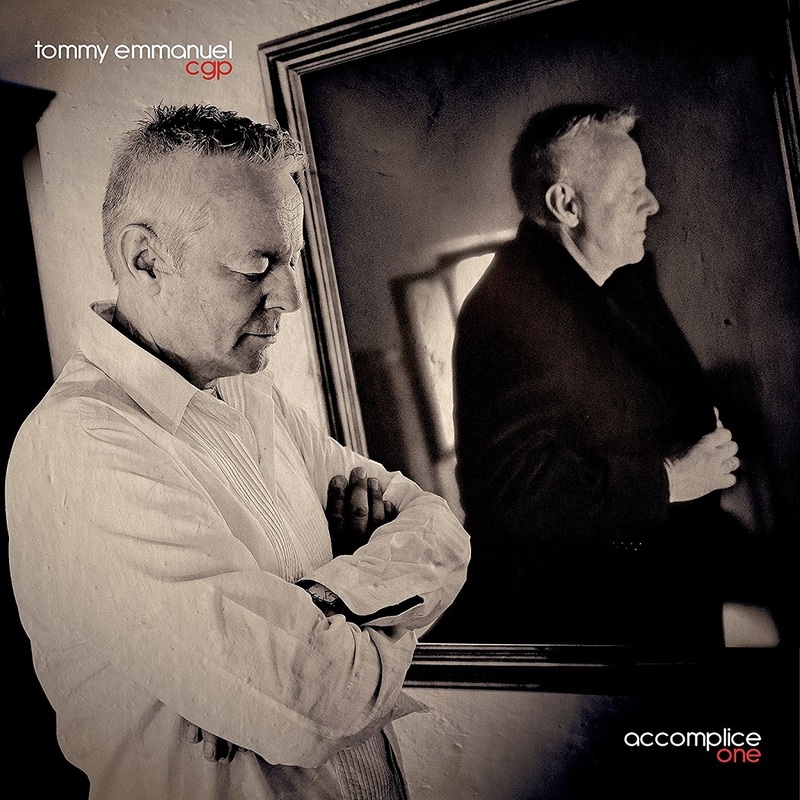 If we know anything about Australian master finger-picking guitarist Tommy Emmanuel it is that, among other things, he loves collaborations and has an affinity for Nashville. 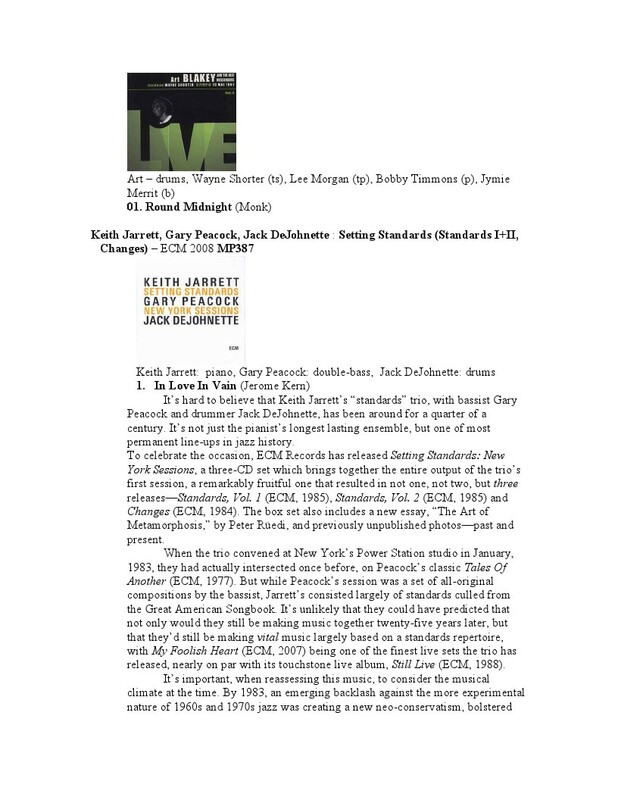 His recent 2017 live release was recorded at the Ryman, the city’s most storied venue, and his partnership with mandolin maestro David Grisman the same year was another in a long lineage of pairings with other musicians throughout his nearly 40-year solo career. So it’s little surprise that Accomplice One emphasizes both those aspects of his professional persona. Each of its 16 tracks features a different collaborating artist with the majority recorded in, or just outside of Nashville. But while there are plenty of instances of acoustic fret shredding on this hour long romp — strap in as Emmanuel goes toe to toe with J.D. Simo’s Telecaster and banjo man Charlie Cushman on a hot wired “Wheelin’ & Dealin’”— there are just as many that display his subtlety and taste. 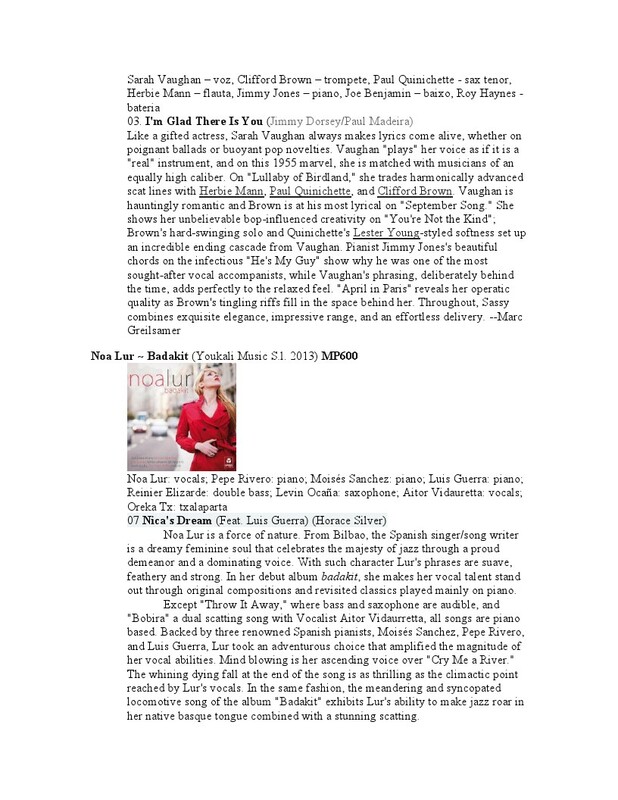 Suzy Bogguss brings her always moving singing to an emotional and melancholy “The Duke’s Message” about persevering in hard times, and ukulele expert Jake Shimabukuro adds warmth to a lovely instrumental “Rachel’s Lullaby,” both original Emmanuel ballads. He digs back to his jazz roots with a sweet cover of Django Reinhardt’s “Djangology” (recorded, like much of this, live in the studio) and a peppy, caffeinated Duke Ellington’s “C-Jam Blues,” the latter featuring Grisman doing his dawg music thing. The diversity of covers continues with Emmanuel and Dobro king Jerry Douglas ripping into a lively, vocal-free take on Hendrix’s “Purple Haze” (Douglas also covered Jimi’s version of “Hey Joe” on his recent release) and gets soulful singing and playing on a honeyed, folksy and playful rendition of Otis Redding’s “(Sittin’ On) The Dock of the Bay.” While Emmanuel’s voice isn’t particularly distinctive, he delivers the few songs he takes lead vocals on with impressive modesty. Jorma Kaukonen, Mark Knopfler and ex-Allman Brothers Band guitarist Jack Pearson and others are also along for the rootsy ride. All involved seem to be having a delightful time — some of the tunes are first takes, most are overdub free — and the musicianship is as superb as you’d expect. There’s nothing wrong with trying to expand your audience because Emmanuel remains true to his organic nature, exploring styles that have been a part of his oeuvre for decades. 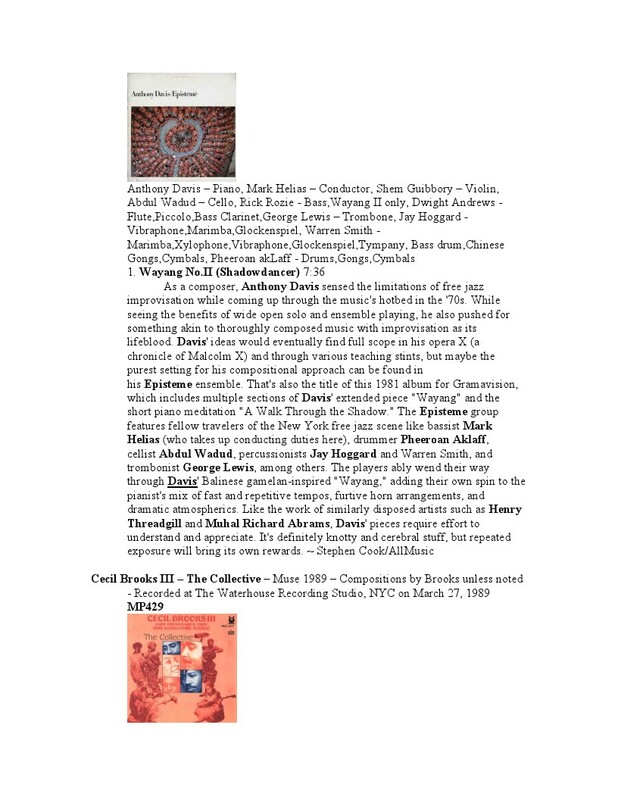 While serious stringed music students will devour every note here (he thoughtfully includes the make and model of the instruments used in the credits), Accomplice One will also appeal to roots music lovers who have never picked up a guitar. Le Kami Octet est donc né d’une suite logique de l’aventure, un nouvel aboutissement en attendant la prochaine mutation. Au travers de cette aventure, l’oreille reconnait tout de même un fil qui se déroule depuis ces 13 années : « Kami c’est moi, mon ressenti, ma pensée politique, mon histoire. 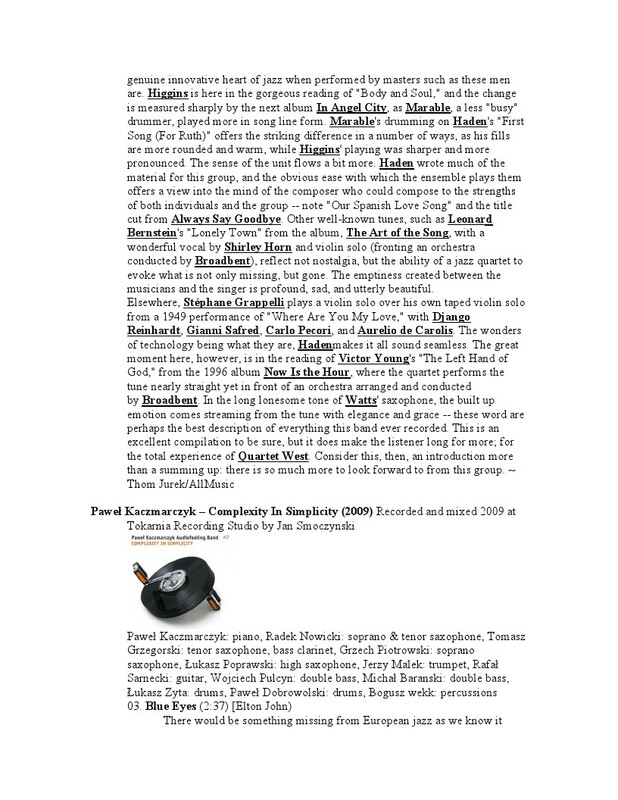 » Pascal Charrier s’est donc replongé dans la composition d’un nouveau répertoire en puissant dans les travaux de musiciens comme Steve Coleman, Carla Bley, Marc Ducret, Magic Malik et plus récemment Morton Feldman ou Gérard Grisey. 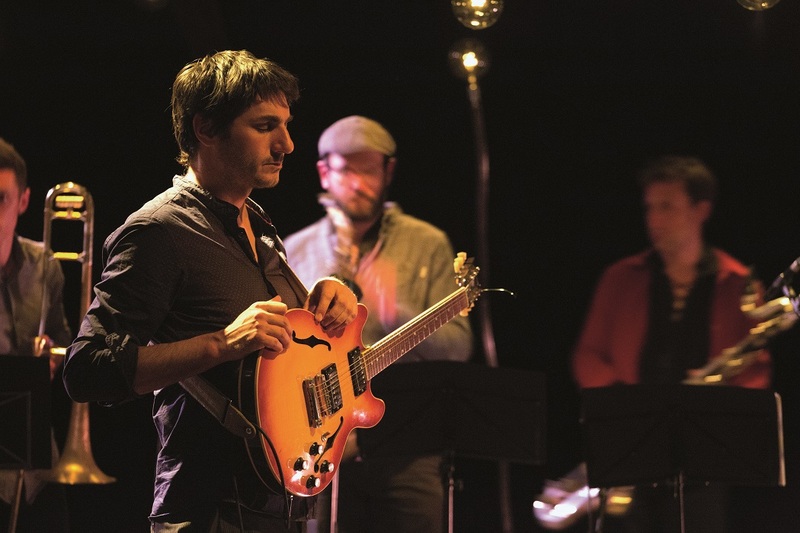 C’est la raison pour laquelle sa musique « s’inscrit dans la tradition du jazz contemporain ». Toujours au service d’un propos narratif et poétique qui s’appuie sur deux axes : la transe (recherche sur le rythme, les superpositions, les cycles très longs…) et les textures sonores (sons naturels des instruments et effets électroniques). 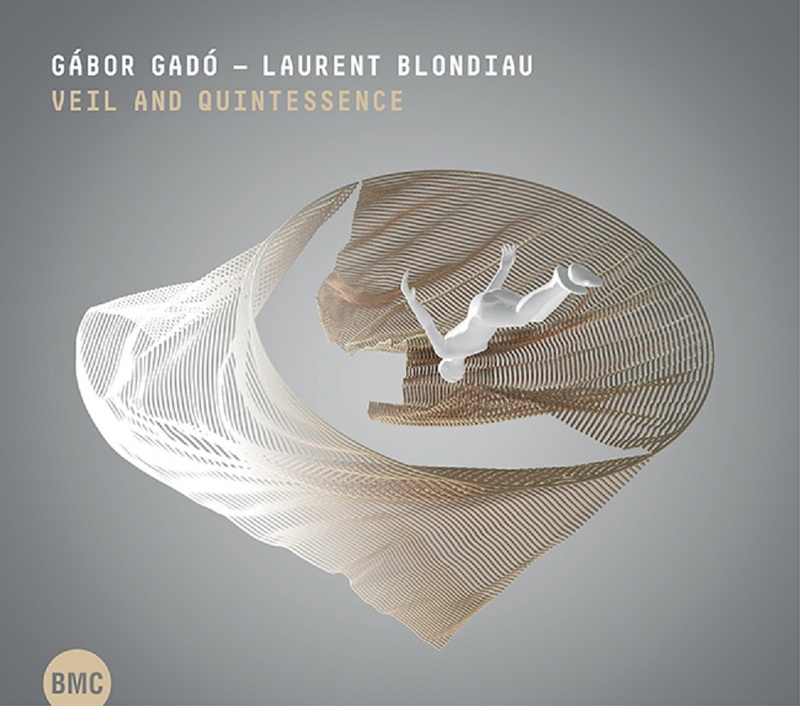 When we met Gábor Gadó at the turn of the century, we were delighted by the profound musicality apparent in his quartet at the time, and in his collaborations with the singer Gábor Winand, as well as by the prospect of exploring the treasures welling up time and again, in a sustained rhythm initially on the BMC label. 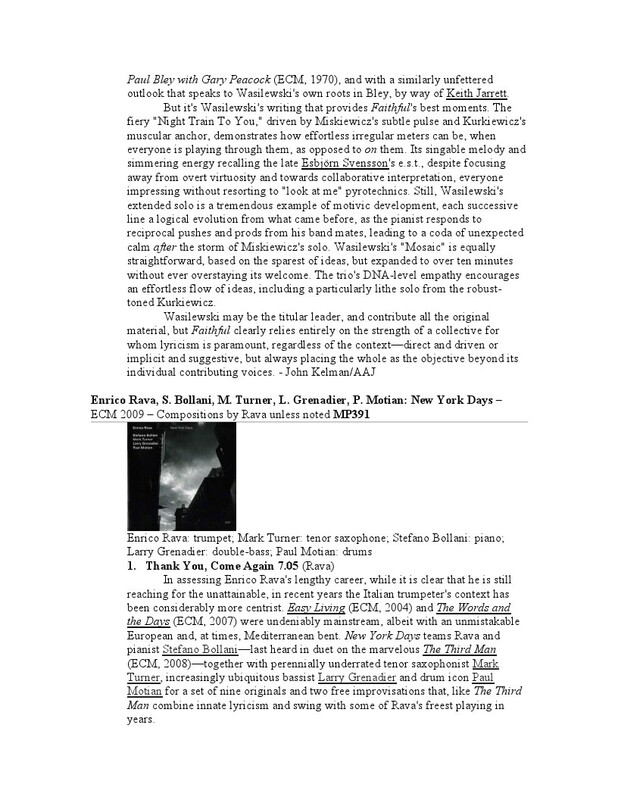 In addition, despite the brief parenthesis of a concert recorded in a quartet with David Liebman (Ungrund, 2011), when, ten years ago this phonographic spring seemed to dry up, listeners whose only access to Gábor Gadó’s work was via discs may have believed his activity had ceased. Yet, in the quasi penumbra of these years without releases, Gábor Gadó has been working on an intense deepening of his language on stage, and also over a series of unpublished recordings. And while the last to appear, Byzantium (2007) and Lung-Gom-Pa (2008), suggested growing abstraction, the first lines of Weltraum on ‘Ungrund’ testify to a return to the fundamentals of Baroque music in the constant company of the music of Johann Sebastian Bach. 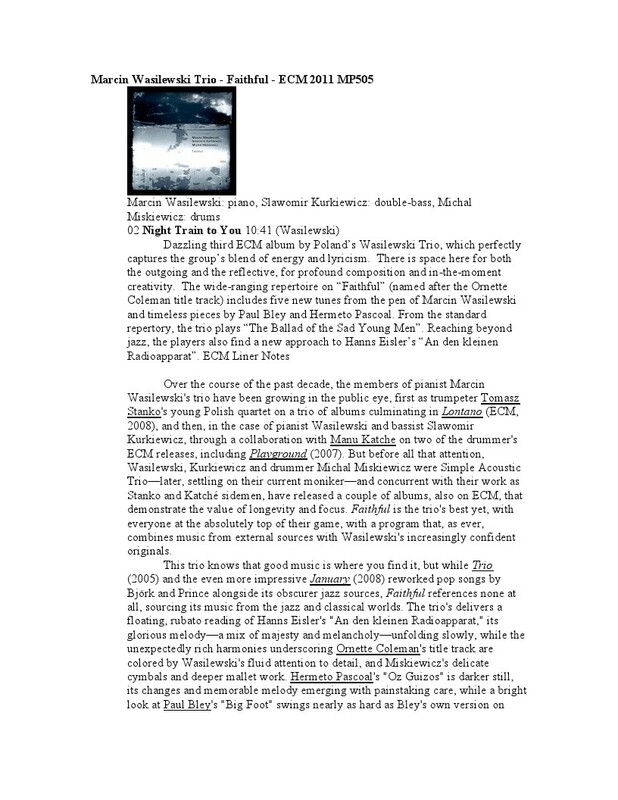 The pull of this aesthetic, made concrete in recent years in his collaboration with the composer and pianist Barnabás Dukay, has its resolution (not its dissolution) in this phonographic resurgence under the title ‘Veil and Quintessence’, another episode in the frenzied quest which is the source of Gábor Gadó’s music. 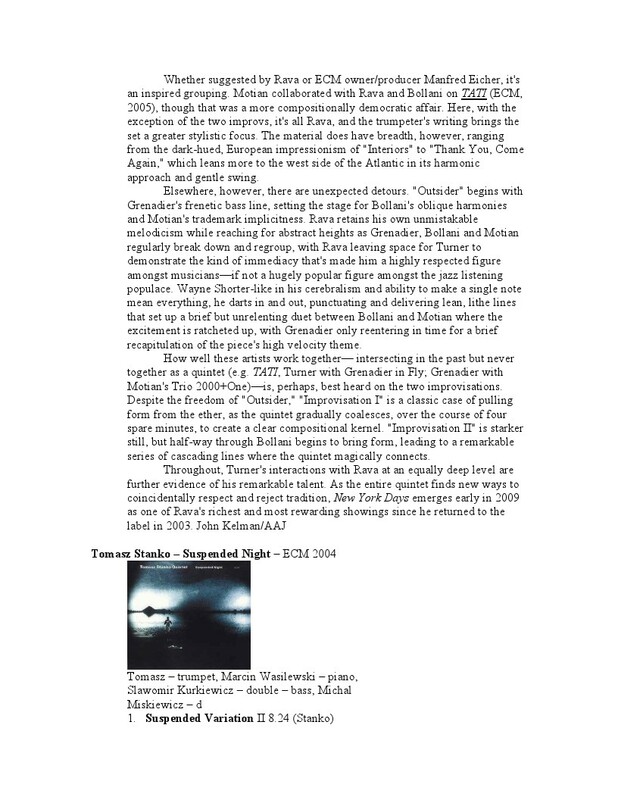 This duality is incarnate in Laurent Blondiau (encountered Gábor Gadó as part of the group Unit in 2004), whose tone is at times very pure, almost celestial, evoking Kenny Wheeler, and at times ‘besmirched’ with jungle mute effects, recalling the trumpeting style of Ellington. Born in 1968, and trained at the Royal Conservatory in Brussels, he has had a wealth of experience ranging from modern jazz (at the desks of the Brussels Jazz Orchestra) to the legacy of Steve Coleman (transcended within the changing line-up of the group Octurn), passing to encounters with Gnawa musicians (leading Maäk’s Spirit) and the collaboration with Andy Emler’s MegaOctet which in France in 2009 brought him the European Prize from the Jazz Academy, previously awarded to Gábor Gadó in 2003. 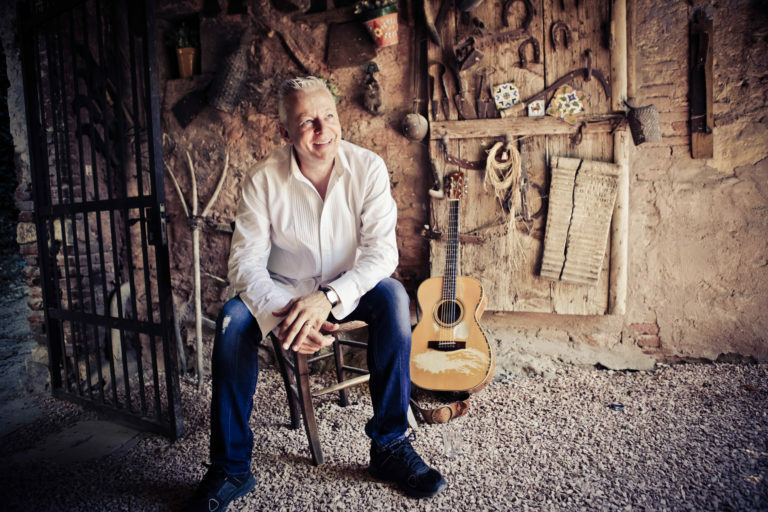 Gadó, eleven years his senior, was trained in a school of choral singing and in the Kodály method, playing the guitar in popular dances, and went on to the study jazz at the Béla Bartók Conservatoire in Budapest. Though his guitar style, recognisable since the 1990s, has its roots in his listening to the Abercrombie-Metheny-Frisell generation, he has personalized it with a subtle, highly intimate relationship with modal traditions and tonal harmony, and more generally with the great artistic and spiritual traditions of Mitteleuropa and oriental mysticism. 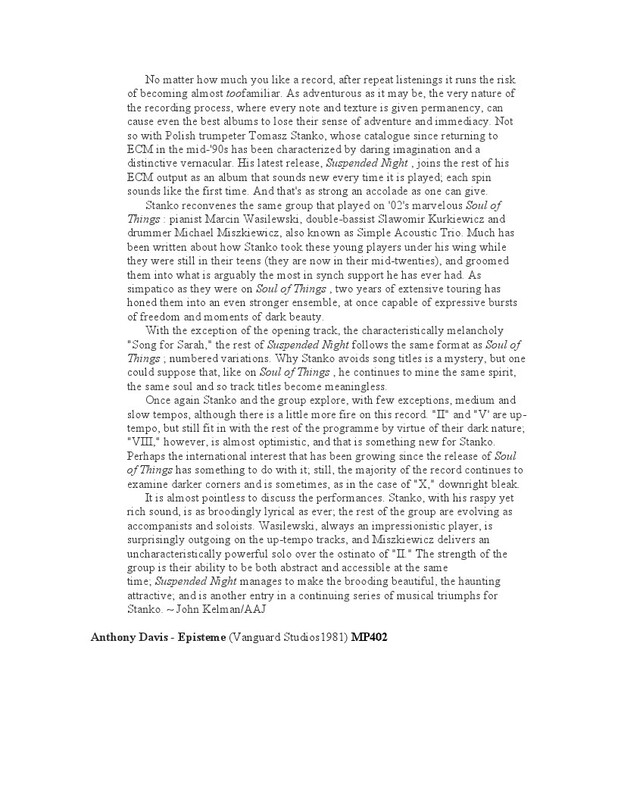 Over the years, the importance of Bach has grown in his interior world of his imagination, where chromaticisms inherited from polytonal jazz of the 1970s ‘add spice to the Baroque severity.’ From one piece to another, or within one and the same piece, he appears to move with great stylistic unity from a folk, modal idiom to the harmonization of a Protestant chorale and to the fluid voice-leading typical of writing for the string quartet, in a symbiosis of the horizontal and the vertical, of the contradictory enticements of the ostinato and modulating harmony. In contrast to the clear lines of the trumpet is his way of dimming the apparent attack of his guitar to the sound of a chorale or a church organ. Because everything here is a prayer, a meditation, a vigil and contemplation in a sense the West has forgotten, a sense which its poets and thinkers have gone to seek in oriental mysticism, to throw off the veil covering the quintessence of existence and to reconcile shadow and light. 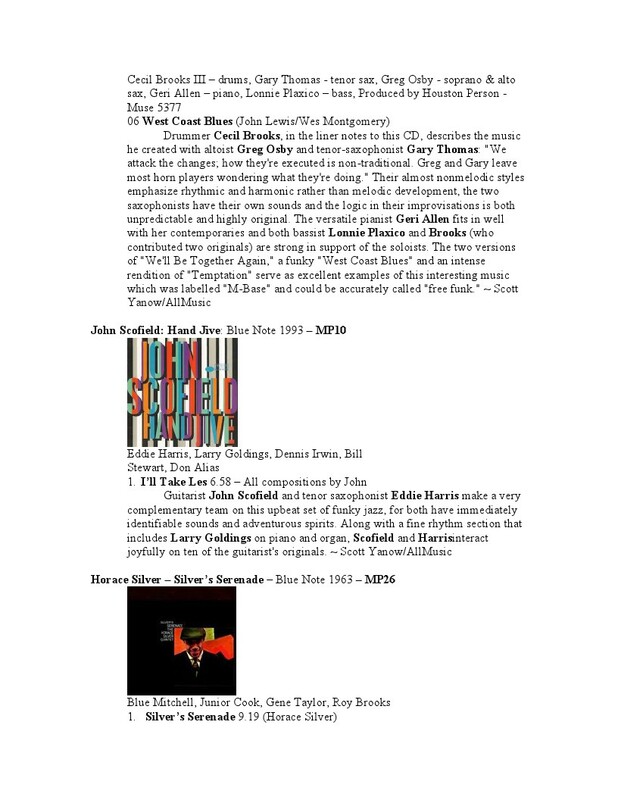 Playlist for Tom Ossana – The Thin Edge – January 24, 2018 MST 7:00 to 9:00p.m. Let’s have an update on the idea of “Moldy Figs.” In my mind, the term should be applied to jazz before the mid-forties bop revolution led by Charlie Parker, Dizzy Gillespie, Bud Powell, Max Roach and to some extent, Lester Young and the esoteric Thelonious Monk. The music continually evolved from that point up to 1969, a time that was less moldy. For the next twenty years jazz developed an inferiority complex brought about by the rock explosion which led most jazz performers to include that genre in their efforts. There is no fig to describe this period; it was jazz’s dark ages. 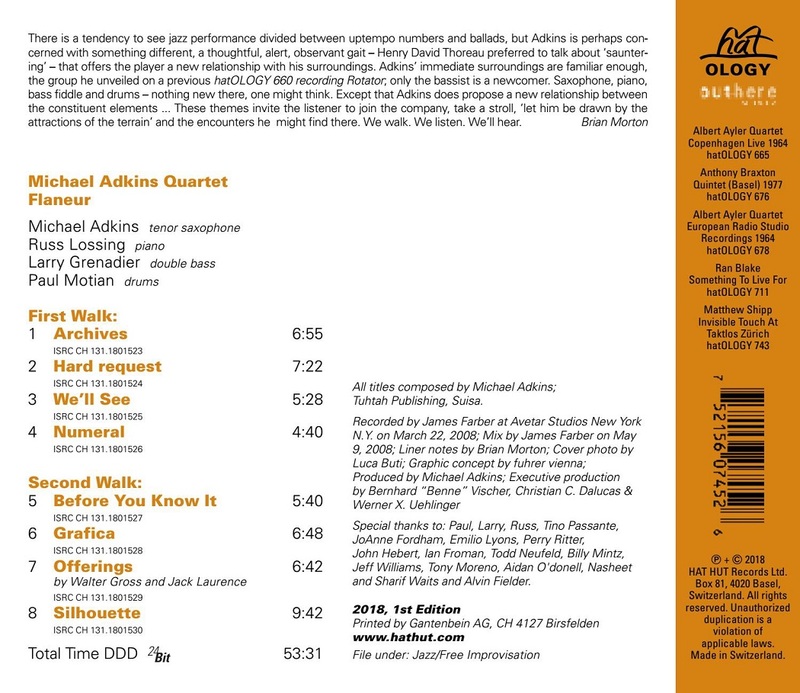 From the nineties forward jazz has resurged with artists better educated, more facile, their energies devoted to taking the music to the next level. This is an oversimplification, obviously, as the results have been spotty. 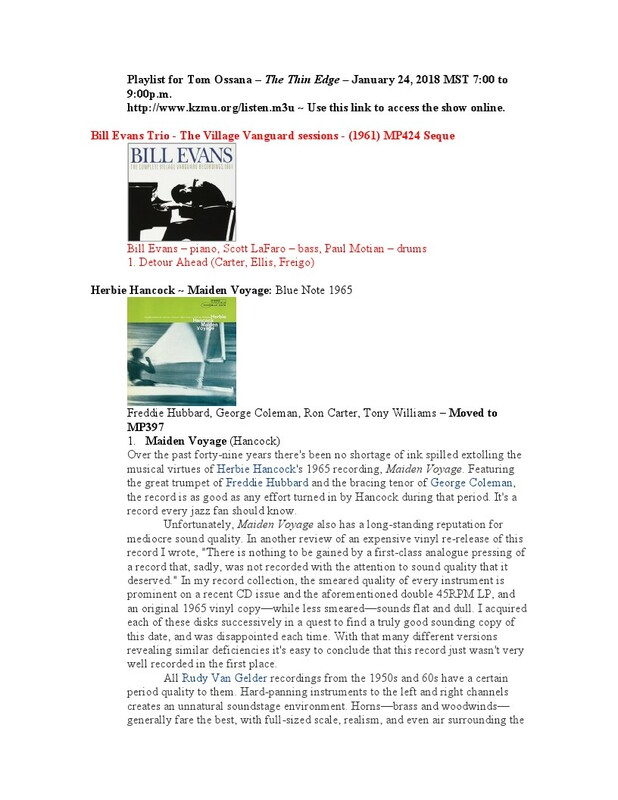 Labels like ECM, ACT, SteepleChase and Cellar Live seem be the important players, outpacing Blue Note and Concord Jazz. As for Wednesday’s show, we begin – finally – with Herbie Hancock’s title track from his 1965 Blue Note “Maiden Voyage”. My favorite pianist currently, Marcin Wasilewski, follows with his “Night Train to You” from his “Faithful” (ECM 2011). Italian great, Enrico Rava brings this half to a close with “Thank You, Come Again” from his “New York Days” (ECM 2009). 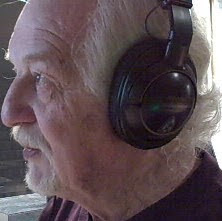 If you’re curious about details about the show, go to Republic of Jazz and search for Tom O. Polish trumpeter Tomasz Stanko gets the second half going with “Suspended Variation II” from his “Suspended Night” (ECM 2004). 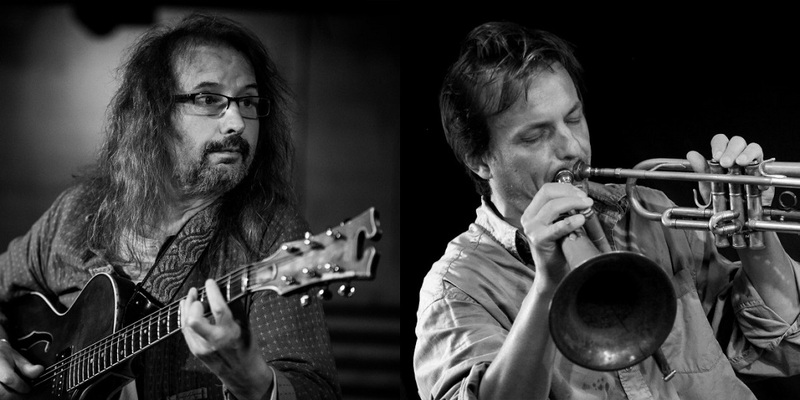 This one features the Wasilewski trio: Marcin, Slawomir Kurkiewicz and Michal Miskiewicz. Borrowing from Gamelan, the traditional ensemble music of Java and Bali in Indonesia, we get “Wayang No. II” (Shadowdancer) as imagined by pianist Anthony Davis from his “Episteme” (Vanguard Studios 1981): otherworldly and utterly fascinating. Never heard before on this show comes drummer Cecil Brooks III and his cover of John Lewis and Wes Montgomery’s “West Coast Blues” from Cecil’s “The Collective” (Muse 1989). The group includes heavy hitters Gary Thomas (ts), Greg Osby (as), Geri Allen (p) and Lonnie Plaxico (b). John Scofield recruits Eddie Harris’ tenor sax in a performance of “I’ll Take Les” – a nod in the direction of legendary guitarist Les Paul – from his “Hand Jive” (Blue Note 1993). From one of pianist Horace Silver’s big hits from the early 60s, we’ll hear the title track from his “Silver’s Serenade” (Blue Note 1963). The group features the trumpet of Blue Mitchell and the tenor sax of Junior Cook. 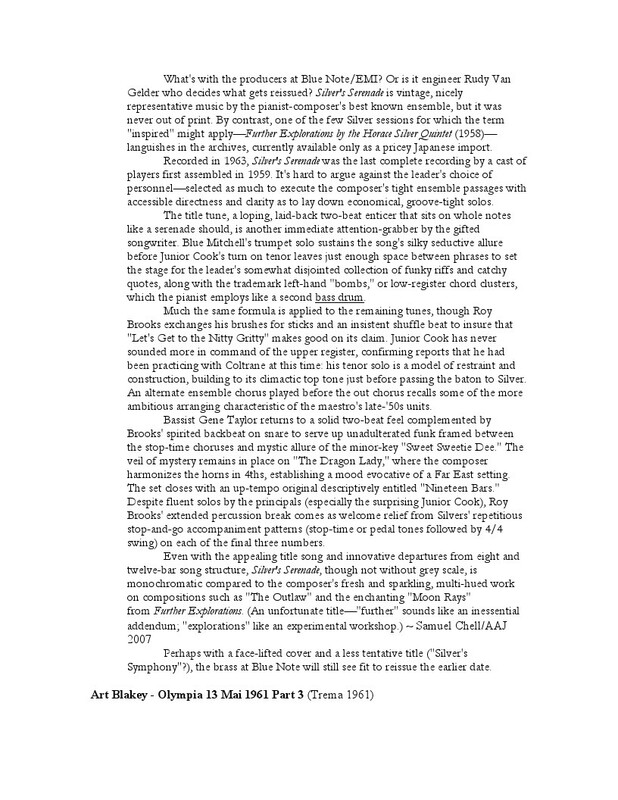 “Olympia 13 Mai 1961 Part 3” (Trema 1961), an obscure live Art Blakey recording, follows with his treatment of Monk’s “Round Midnight” featuring Wayne Shorter, Lee Morgan and Bobby Timmons. 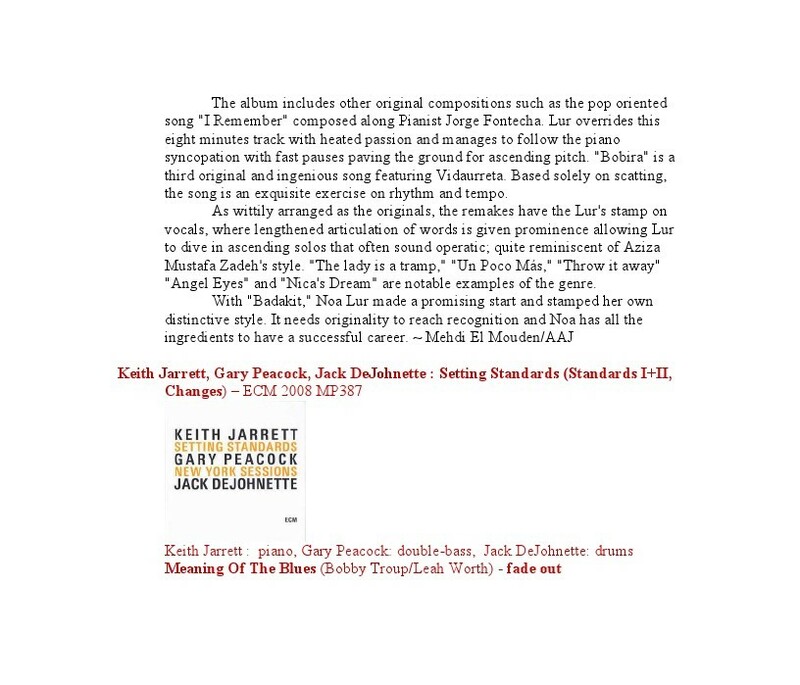 Keith Jarrett, Gary Peacock, Jack DeJohnette: “Setting Standard (Standards I+II)” (ECM 2008) closes this half with a cover of Jerome Kern’s “In Love in Vain”, a tune from the American Songbook that will make the idea of romance inevitable. 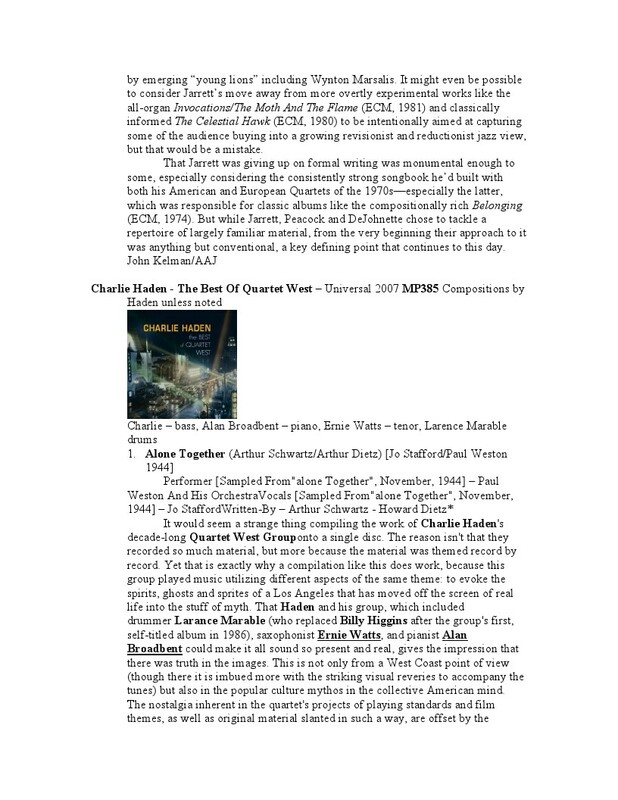 Charlie Haden’s “The Best of Quartet West” (Universal 2007) gets us cuddling with a cover of Schwartz and Deitz’s “Alone Together”, unusual in that it merges Jo Stafford’s vocal from her performance with Paul Weston and His Orchestra 1944. 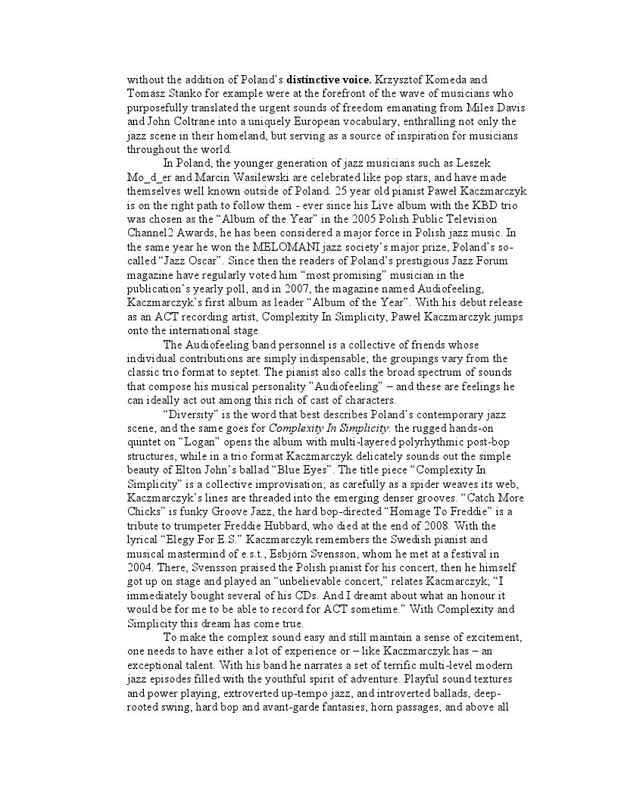 Pawel Kaczmarczk, another Polish pianist of note, follows with his treatment of Elton John’s “Blue Eyes” featuring a large Polish ensemble. 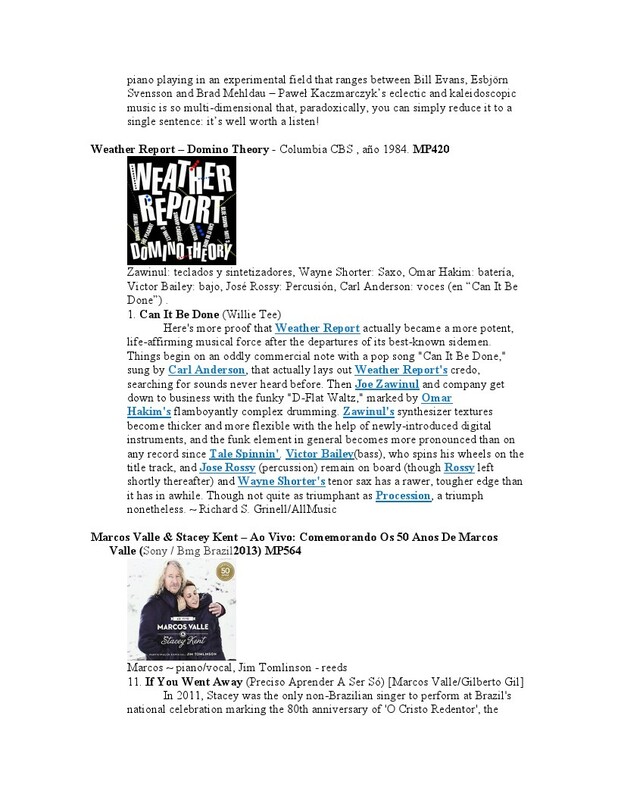 Vocalist Carl Anderson gets together with Weather Report in a cover of Willie Tee’s “Can It Be Done” from the group’s “Domino Theory” (Columbia 1984). Marcos Valle & Stacey Kent (and her husband, tenor saxophonist Jim Tomlinson) help us understand the pain “If You Went Away” (Marcos Valle/Gilberto Gil) from their “Ao Vivo: Comemorando Os 50 Anos De Marcos Valle” (Sony/Bmg Brazil 2013). 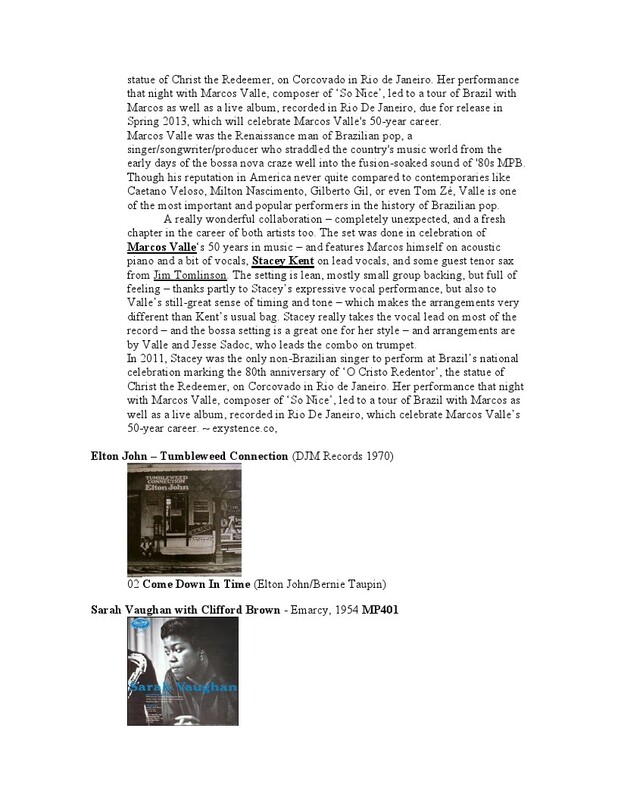 “Come Down in Time” – one of Elton John and Bernie Taupin’s most enigmatic compositions – follows from Elton’s “Tumbleweed Connection” (DJM Records 1970). “Sarah Vaughan with Clifford Brown” (EmArcy 1954) is next as she interprets Jimmy Dorsey and Paul Madeira’s “I’m Glad There Is You” featuring Clifford’s trumpet, much missed Paul Quinichette’s tenor, Herbie Mann’s flute and Jimmy Jones’ piano. 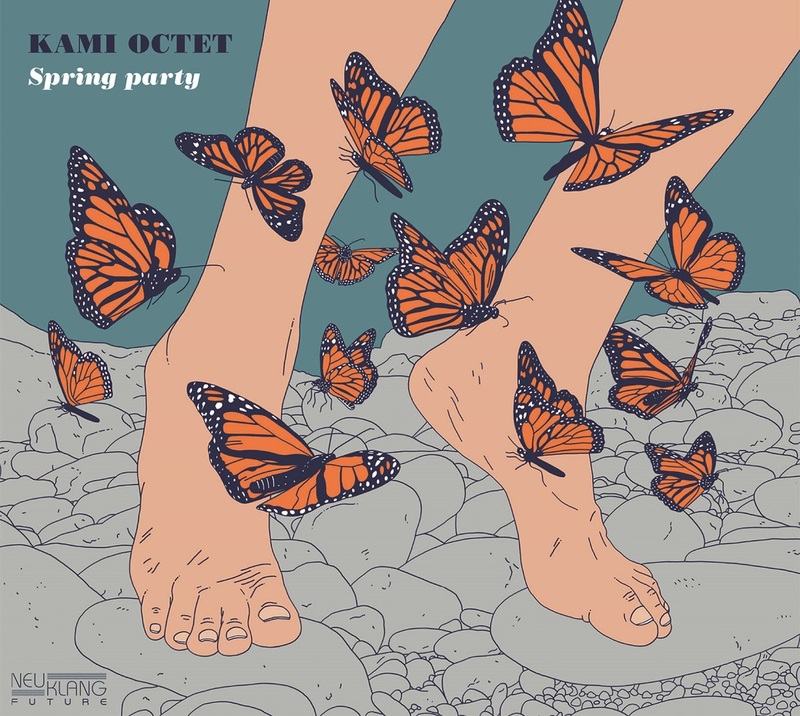 Acting on a request from Juan, we’ll conclude this romantic soirée with Noa Lur’s take on Horace Silver’s “Nica’s Dream” from her “Badakit” (Youkali Music S.I. 2013) featuring Pepe Rivero’s piano.